I flew to India for work. Prior to the trip, grandma made alot of noise saying that I shouldn't go and asked me to talk to my boss again that I will not go. Then later on, she said that she will go to Guanyin Temple to pray for me and get me an amulet. She also gave me some "sacred water". My mom helped me to pack my luggage and my dad specially woke up early in the morning to remind me to be careful and don't talk to anyone who seem to be unusually friendly. My godma said that she will pray for me and asked me to bring a rosary with me. My friends all wished me a safe trip. This is my first trip alone. Flying alone and sleeping in a foreign land alone. There's a first time for everything. And well, I made it back alive. Thank God. 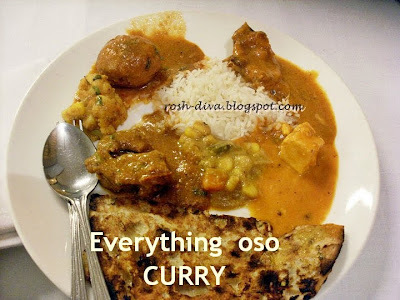 EVERY MEAL also must have curry one. Sianz. Finally, I had fine-dining at Masala Art restaurant in Taj Palace Hotel. Excellent service. They will feel offended if you say 'It's okay' or if you do it yourself. I was totally spoilt and pampered like a queen (只差没喂我吃). 1. If you can afford it, fly business class, otherwise be prepared for long queues in the airport for the immigration to clear. I have never seen longer queues than the Delhi airport. 3. Do not eat / drink from roadside stalls. They simply look too contaminated. I only took water from my hotel room. I refuse to drink even from the mineral water bottle that the driver bought. 4. Do not roam around alone anywhere, especially if you are a lady. It is really not safe. I had countless curious stares and not a very pleasant experience. 5. Check the temperature before you reach. New Delhi can be as hot as 40 degrees and as cold as 10 degrees in the night. I had terrible experiences there during my one month backpacking trip in India too! but there were unforgettable memories too!! :) and luckily i went in winter... 40 degrees can kill! @ jo@nne -- wear long sleeves to "filter" the heat from your skin. @ xiaoxin -- you are so BRAVE... u went there for one month! Wah! You are so brave! I dont think I will want to go there! wow india!!! damn i am too scared to go to that place!